The Chamber gives A+ Awards to individuals and organizations that enrich the life of the community through their work in education, business, and civic engagement across the area that the Chamber serves (Amherst, Belchertown, Hadley, Leverett, Pelham, Shutesbury, and Sunderland) and the Pioneer Valley as a whole. 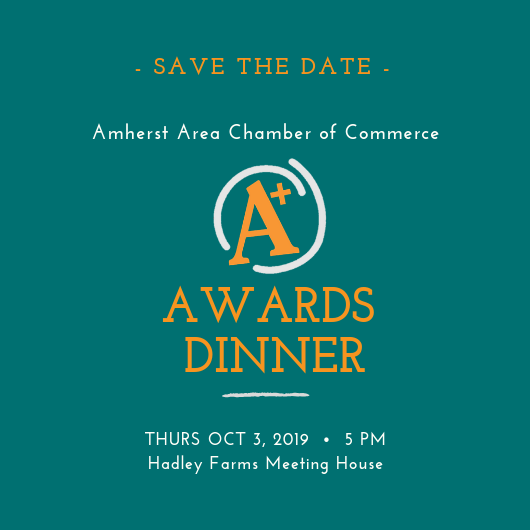 Save the date for the 2019 Annual A+ Awards Dinner: Thursday, October 3, 2019 at the Hadley Farms Meeting House. Thank you to PeoplesBank, our Presenting Sponsor, Giving Back since 1885. Please visit our Facebook page for full photo album of the 220 guests who gathered to celebrate business and community. Thank you to ALL who supported this event. See you next year!